I am surprised at what is being sold as progressive metal these days. 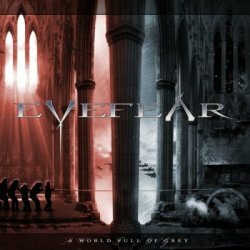 Eyefear are another average progressive power melodic speed metal band, which eventually is nothing more than a melodic metal band with mystical lyrics and sometimes epic keyboard arrangements. When I grew up, WatchTower and Mekong Delta were prog bands, and I could well live with the thought that mode melodic acts like Dream Theater and Fates Warning could label themselves progressive too. But Eyefear? Sorry but no! A World Full Of Grey is their third album in ten years, making them not the busiest band in their native Australia. I was not surprised to learn that they are best friends with Black Majesty, another melodic power metal band I could live as well without. The problem with those bands is that they let themselves be inspired by one or a few bands (in the case of Eyefear, Fates Warning are more than just an influence), and then try to copy that sound as closely as possible. As Eyefear’s songwriting abilities are not up to par with those of the American masters, you get eventually an album which is of a mediocrity that is hard to believe. You can listen to the entire album and not even notice that the last track is a radio edit of the opener. Or, to quote the late Douglas Adams: mostly harmless. Apparently there are still people around who really dig this very unprogressive kind of progressive metal, and they are really welcome to check this out. But with Mekond Delta just having released the true prog metal album of the decade, I better shelve this one quickly.